A DOG trainer from Horsell has been named a finalist in the national annual Animal Hero Awards for a scheme that helps dogs and young people with behavioural difficulties. 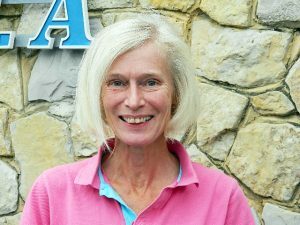 Dr June Williams, who runs Paws4Change at the RSPCA Millbrook Centre in Chobham where she is a volunteer, has been nominated for Special Recognition in the awards run by the RSPCA and the Daily Mirror. Dr Williams, a former teacher at Horsell CofE Junior School, started the programme in 2009 as a way of helping young offenders on the back of the success of a similar scheme in the United States. Paws4Change has now developed to include young people from a variety of backgrounds, including those not in mainstream education and some with learning difficulties. The youngsters help to train the dogs, under the supervision of experienced dog trainers, and more than 60 have taken part in the scheme that runs two to three times a year. June told the News & Mail: “At the end of the five days, we have dogs that can now eminently be rehomed, and it benefits the young people for whom it is often the first time in their lives that they have achieved anything. “They are assessed to see if they have passed all the exercises they are given. If they pass, they are given a rosette and a certificate in a ceremony to which they can ask their support workers and friends and family. “They learn about anger management and they bring out the best in the dogs that come from seriously deprived backgrounds. “The young people who take part are absolutely committed – we have total attendance and now have waiting lists. They stay in touch with us after the programme and come to see the dogs. June said the scheme, which is run in conjunction with Surrey Youth Support Services, had come under pressure from Government spending cuts, but it has now been saved by two very generous donors. She said she was absolutely thrilled to have been nominated in the awards, which were due to be handed out in a ceremony in London hosted by actress and Britain’s Got Talent presenter Amanda Holden this week. “It’s very good to have the scheme recognised and my part in it,” June said.